This time, I would like to run a survey among my friends who are living in Singapore and experienced with food stalls those selling Myanmar Foods especially in Peninsula Plaza. Normally, most of our Myanmar people used to go to Peninsula plaza for certain reasons, some people go there for transferring money to home, some people go there for having food of our own tastes. Before two years in the past, there had not so many Myanmar food stalls in Peninsula plaza, we have a few of them, like Mya Nandar, Ye Yint, and etc., Now today we have a handful of food stalls opened since about one year ago and currently running their business and serving people. Most of the time, we used to go to same food stalls which we think quite OK for us for some reasons. I found out that some of the food stalls are full with customers most of the time, and some don’t. Then, I got an idea of what our Myanmar people likes in their food stalls and what we don’t like. I would like to run a survey. I would like to run survey for two reasons. We can pick up one of the restaurants that meet much of our customers’ requirements. In our culture, if we feel something bad, we felt that this is our individual problem and we do not have place to let the other people knows that we do not like this thing and that thing. Actually, if a stall have low level of customer satisfaction standard makes feel bad to other people too. 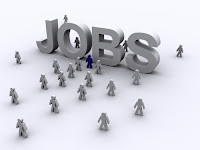 By doing this survey, the restaurant got the highest rank in survey will be ideal for the rest, and the rest who do not win the highest rank also will try to improve their service standards in future. You don’t need to enter any personal data on this survey and this survey is running anonymously. I would like to run this survey quarterly for a year. I hope that visitors who visit Mgluaye’s pages will help and contribute with their opinion in this survey. It can help yourself and others by let food stalls knows that they are at the highest rank in customers’ satisfactions or they need to improve their service standards. Survey will be opened a week period of time for your opinions to fill in, and closed on 15th August 2010. Then the results will be announced on mgluaye's pages. I would like to say Big “Thank you” in advance. Update : Survey was ended on 15th August 2010. Thank you. 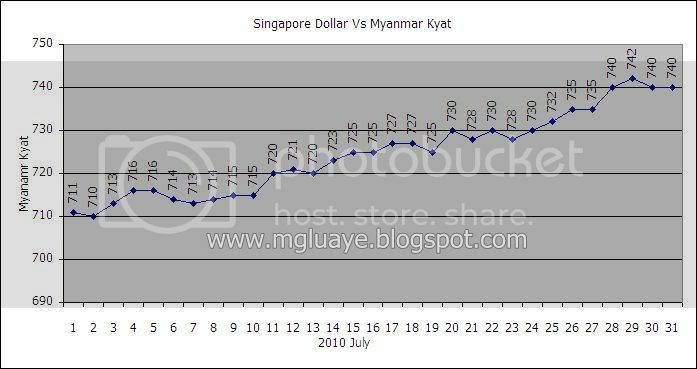 For the month of July 2010, the average exchange rate between SGD and Myanmar Kyat was 724.5161 Ks/SGD (17.9828 up from previous month average rate), highest was 742 Ks/SGD on 29th of July and fell lowest until 710 Ks/ SGD on 2nd, of July. 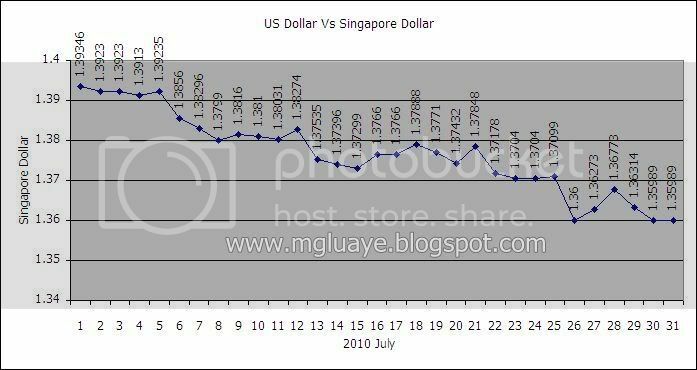 For USD vs SGD, the average rate for the month of July was 1.3767 SGD/USD (0.0209 down from previous month average rate), highest 1.3935 on 1st of July and lowest 1.3599 on 30th and 31st of July.